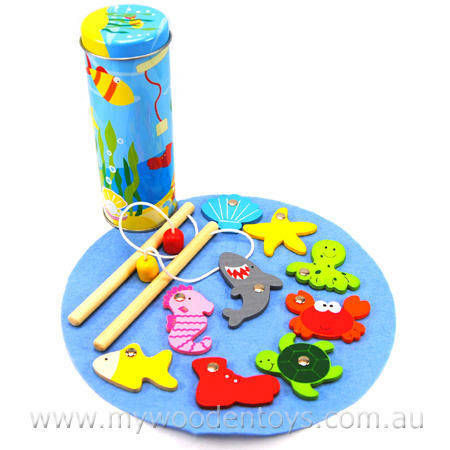 Magnetic Wooden Fishing Game in Tin comes with twelve wooden pieces depicting things you may catch whilst fishing. There is a Shark, Starfish, Treasure Chest, Old Boot and Crab to name few and it comes with a blue felt circle so you have a nice playing space. This sweet set has two fishing rods and comes in a handy take anywhere tin. With nice bright colours and a smooth finish this is a lovely working of a classic game. Size: Felt circle is 24cm across. Rods are 16cm long. We like this because:"Has anyone ever caught a boot when fishing? A really fun little game."